Everything seems to be in order, as these performances typically go -- the woman is clearly faking, her performance is uninspired and unimaginative, she's a bad actress, even, but she's making money hand over fist anyway -- to a skeptic, Ariaura is obviously faking, but there isn't much to be done about it. "But fear not," Ariaura said, "For a New Age is coming, and age of peace, of spiritual enlightenment, when thou--doing here listening to this confounded claptrap?" I looked up sharply. Ariaura's voice had changed in midsentence from Isus's booming bass to a gravelly baritone, and her manner had, too. She leaned forward, hands on her knees, scowling at the audience. "It's a lot of infernal gabble," she said belligerently. Awesome. Awesome awesome awesome. 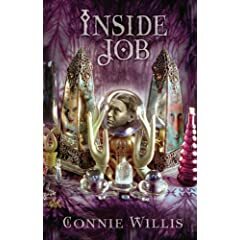 Really, Inside Job is just irresistible -- spiritualism and debunkers, a bit of romance, a whole lot of H. L. Mencken, jabs at intelligent design and DUDE -- Connie Willis is a fantastic storyteller. It's an adorable story and it reminded me, at times, of old noir movies/books. AND it's funny. If you need some sort of fancypants recommendation, it just won a Hugo. Yesterday, a new Connie Willis fan was born! I got to the library today, zipped to the computer, ordered another one of her books and then ran over to the biography section and grabbed a book about Mencken. I'm going to be a busy lady.